Venous thrombosis of pancreas transplant allografts often leads to graft loss. We evaluated the efficacy of emergent endovascular techniques to salvage thrombosed pancreatic allografts in a series of six patients. Of the 76 pancreas transplants performed between 2002 and 2006, six patients were diagnosed with venous thrombosis on MRI between 2 and 28 days posttransplant (mean, 9 days). Five patients were systemic-enteric (donor portal vein anastomosis to recipient iliac vein) and one patient was portal-enteric (donor portal vein anastomosis to recipient superior mesenteric vein). 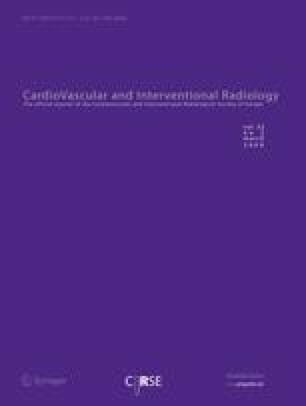 Conventional venography confirmed the diagnosis of venous thrombosis in all patients. One patient was treated with catheter-directed venous thrombolysis and balloon thrombectomy. Another patient was treated with rheolytic thrombectomy alone. The remaining four patients were treated with a combination of these mechanical and thrombolytic techniques. Completion venography revealed >50% clot reduction and resumption of venous drainage in all patients. One patient required additional intervention 16 days later for recurrent thrombosis. Two patients required metal stent placement for anastomotic stenoses or kinks. One patient required pancreatectomy 36 h after attempted salvage secondary to a major hemorrhage and graft necrosis. Two patients recovered pancreatic function initially but lost graft function at 8 and 14 months, respectively, from severe chronic rejection. Patient survival was 100%, long-term graft survival was 50%, rethrombosis rate was 16.6%, and graft loss from rejection was 33%. In conclusion, early recognition and treatment of venous thrombosis after pancreas transplantation has acceptable morbidity and no mortality using short-term endovascular pharmacomechanical therapy.